Travels across Texas covering TexasGOPVote's political news often brings me in contact with other real news happening in the state. 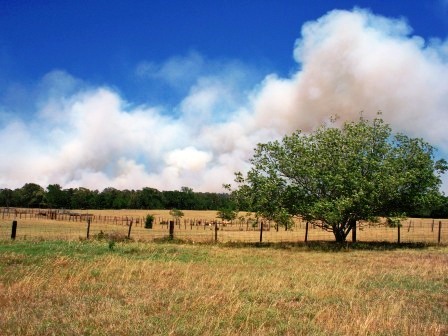 Today, while headed to Dallas, I came across a wildfire consuming the forests of Walker County and threatening an exotic game ranch and some very nice ranch homes. 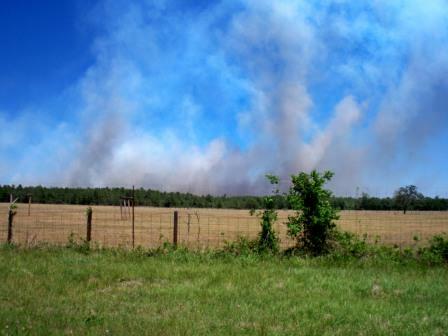 The fire is located about half way between Huntsville and Madisonville, Texas. 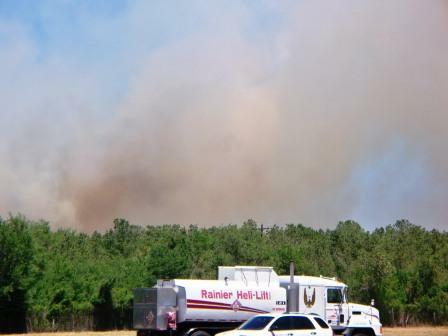 When I arrived, the fire was consuming about 40 acres but it quickly was expanding to nearly 100 as heavy winds moved it southward. While this may not be as exciting as Obama finally releasing his birth certificate, it gave me an opportunity to witness some of the work that goes into fighting these fires. 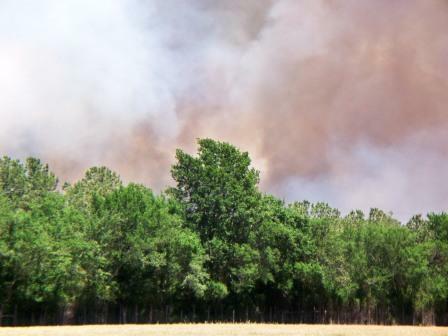 When I happened on the scene, a small red helicopter had just begun its work of filling itself with water from nearby ponds (or tanks as we say in Texas) and flying over the fire to dump it's load. After about 30 minutes of watching this, he had to land and take on fuel. At this point this chopper was joined by a much larger helicopter which, in the following video, big brother just finished taking on fuel and is about to take off while little red is grabbing a load of water from a tank on the endangered ranch. I spoke with some employees of the ranch located on the western edge of the fire. They told me the ranch is stocked with cattle and exotic game which are sold a couple of times a year. Some of the game were in the forest and in danger from the fire. They had opened all gates to encourage the game to move into the open pastures and some were taking advantage of this. Their cattle were penned where they could quickly load them if necessary. 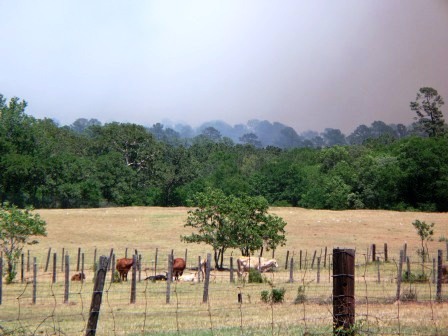 By the time I left, it appeared the fire would save the main area of the ranch and the animals unless some of the game animals were trapped by fear inside the tree covered areas. 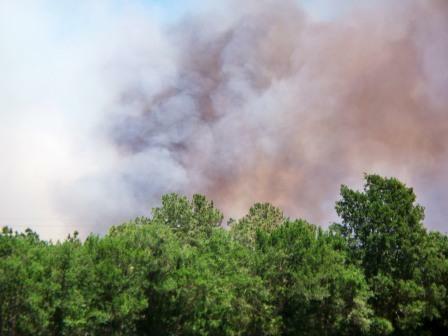 Smoke from the fire would change rapidly in intensity and color. Firefighters told me the dark plumes of smoke were the result of a new tree becoming engulfed in flames, literally exploding as the sap of the pine needles take fire. 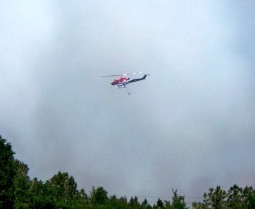 The larger of the two helicopters, I named "big brother", was able to stay on scene longer as it carries more fuel and it can stay over the fire longer as it carries much more water per load. 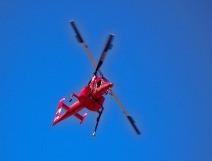 The helicpoters had to fly about a half mile to the west to pick up water and then return to the fire. The fire would flare up and spread quickly when they were not on top of the scene. 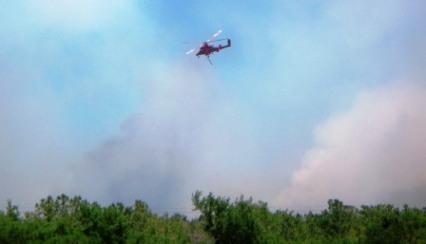 As I left, the fire had spread and was threatening some ranch homes about 5 miles to the south. Please put these families in your prayers and say a prayer for the brave men and women fighting to save the homes and property of these people in Walker County, Texas.